Global microRNA market is highly fragmented owing to presence of various companies, especially domestic players creating immense price competition. Thermo Fisher Scientific Inc. is the leader in the global microRNA market in terms of revenue share in 2016 due to a wide product portfolio. Thermo Fisher Scientific Inc. grabbed major market share as it offers both miRNA reagents and the hardware required for carrying out theses assays. Thermo Fisher Scientific Inc. also offers microRNA products specifically catering to the animal health and agriculture segment. Hence its wide product range catering to different end-users makes it a market leader in the microRNA market. Illumina Inc., takes second position in the global microRNA market. The company has microarray kits and library preparation kits for miRNA. Moreover, NGS of miRNAs is coming into wider use and provides unmatched efficacy in discovering and detecting miRNA. Agilent Technologies, Inc. follows Illumina Inc. with a market share of 7.5%. The company manufactures microarrays and has recently developed a new application for studying miRNAs by combining miRNA method with SurePrint inkjet synthesis technology. This kind of PCR amplifies a given target for some future use, such as DNA sequencing or microsatellite analysis. Gel electrophoresis can tell users if they’ve made a product or not, and the size of that product. This variation on the methodology evolved as the need for more accurate results required more detailed quantitation of the material produced. Quantitative PCR enables scientists, to watch every cycle of the chain reaction, via fluorescence markers. Every cycle should about double the amount of target DNA present. Digital PCR involves splitting a PCR reaction into thousands or millions of individual partitions, ideally such that each one contains either zero or one copy of the target DNA. Each partition is a simple endpoint reaction. It’s digital in the sense that each of the PCR reactions either has, or does not have, a product. There has been a shift from investment in R&D and technology, especially in life sciences and biotechnology, from North America and Europe to Asia Pacific. Emerging economies such as India have ample skilled labor and qualified manpower at affordable costs thereby increasing the scope for attracting outsourcing of biotech projects. Additionally, several governments in these regions have started taking initiatives to support growth of the domestic biotechnology industry by offering tax exemptions for R&D, increased budgets and funding, creating public and private conglomerates and attracting foreign direct investments. Despite the market having several large players as well as multiple smaller companies, there are limited companies that have a complete focus on being a provider of reagents for research and diagnostic use. Different vendors have different specializations and product offerings, with most large companies combining research products and reagents with equipment, in-vitro diagnostics tools. 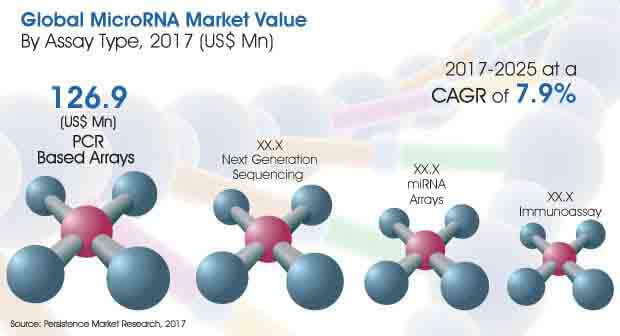 PCR based arrays dominated the global microRNA market in revenue terms in 2016, and the trend is projected to continue throughout the forecast period. PCR based arrays segment is expected to be the most lucrative among all end users, with attractiveness index of 1.6. On the other hand, next generation sequencing is one of the segments in global microRNA market that is estimated to represent US$ 100.4 Mn of the total market in 2017 and is estimated to reach US$ 187.8 Mn by 2025 end, expanding at CAGR of 8.1% over the forecast period of 2017–2025. Dharmacon, a Horizon Discovery Group Co.
BioVendor — Laboratorní medicína a.s.